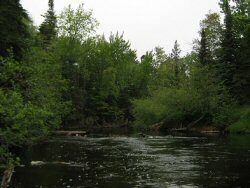 (Michigan Natural River) - The Two Hearted River in northern Luce County flows through a ”wilderness-like” watershed on its way from its headwaters at Whorl Lake to the mouth at Lake Superior. Approximately 44 percent of the river frontage is state owned with the bulk of the remaining private holdings belonging to Cleveland Cliffs Iron Company. CCI manages its lands for timber products and has kept its lands open to public use. The remaining private lands in individual ownership are mainly used for hunting and fishing camps and are in parcels of 40 acres and larger. There are no year-round residences along the river. Two Hearted Canoe Trips, Inc.